Gov. Paul LePage stands with Norman Olsen of Cherryfield, when he was nominated to lead the Department of Marine Resources. Olsen submitted his resignation Wednesday, July 20. AUGUSTA, Maine — Norm Olsen, commissioner of the Maine Department of Marine Resources, has resigned from the position after holding it for six months. The Cherryfield resident, a former U.S. State Department official and son of a fisherman, said in an interview Wednesday afternoon that antagonism from the fishing community, resistance to his initiatives by DMR staff, and a lack of support from LePage were among the reasons he submitted his resignation to the governor after meeting with him and some of Gov. Paul LePage’s senior staff members on Wednesday morning. Olsen, 60, said that he was told in the meeting that he had to improve his relationship with the state’s commercial fishing industry by the end of the summer, or he would face being fired. Olsen said he decided he did not want to wait that long to find out whether he had the governor’s continued support to lead the department. During his six-month tenure, Olsen encountered criticism from fishermen for some of his public comments, in particular his musing at the Maine Fishermen’s Forum in Rockport this past March that Maine, for economic reasons, should consider allowing lobsters caught in bottom dragger nets to be brought ashore in Maine. Massachusetts allows the practice and consequently is where many groundfishermen who also drag up lobster in their nets take their catch. A bill submitted to the Legislature in 2007 to allow the practice was overwhelmingly opposed by Maine’s lobster industry, the dominant fishery in the state — and later was rejected by legislators — on the grounds that it would threaten the long-term health of the lobster resource in the Gulf of Maine. Olsen acknowledged he drew criticism from some members of Maine’s commercial fishing industry but said it comes with the territory. Prior department commissioners George Lapointe and Robin Alden drew the same kind of critical scrutiny, he said. The outgoing commissioner said his critics were communicating directly with LePage’s office, but the governor’s staff would not tell him from where the criticism was coming. He said he had a hard time getting access to the governor, and that when the governor did meet with fishing industry officials, he was not permitted to sit in. “I was basically barred from everything,” Olsen said. In an interview with Mal Leary of Capitol News Service, LePage said Wednesday he was “shocked” by Olsen’s resignation. He said he thought their conversation Wednesday morning had gone well, up to the point Olsen submitted his resignation. LePage denied giving Olsen an ultimatum to appease his critics by Labor Day. “Obviously, he wasn’t listening to what we were trying to say,” LePage said. 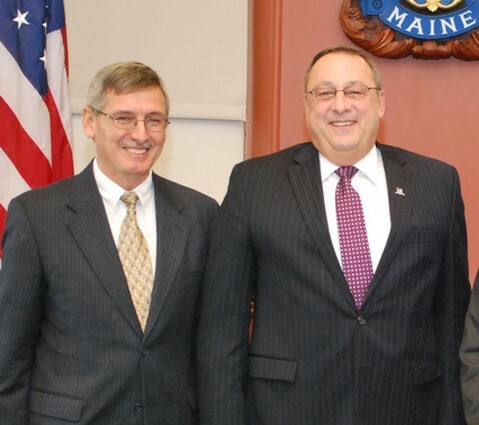 According to a prepared statement from LePage, Patrick C. Keliher, who previously was acting deputy commissioner of the Department of Marine Resources, has been sworn in as acting commissioner and will serve in that capacity during the search for a new commissioner. “I am grateful to Commissioner Olsen for his work in my administration. Moving forward, I’m confident in Mr. Keliher’s abilities to continue our important work of improving opportunities for Maine’s coastal communities,” LePage said in the release. Keliher has worked for the Department of Marine Resources since 2007, when he was hired as director of the Bureau of Sea Run Fisheries and Habitat. Previously he was executive director of the Atlantic Salmon Commission. Aside from industry criticism and his relationship with the governor, Olsen said he also encountered resistance from department staff over some of his management initiatives. Olsen said he made staff sign confidentiality agreements in order to protect proprietary business information submitted to the department and that he made them take ethics training. He also pressured some staffers who supposedly worked from home to work in department offices, where they could be more closely supervised. Industry-fed rumors began circulating among department staffers that Olsen would be fired, which made it more difficult to lead the department, Olsen said. The lack of vocal support from the governor aggravated the situation even further, he said, contributing to his decision to resign. To read Olsen’s statement in its entirety, click here. Of the three people nominated by LePage on Jan. 7 of this year to head up state agencies — all of whom later were confirmed by the Senate — Olsen lasted the longest. Darryl Brown, former commissioner of the Department of Environmental Protection, and Philip Congdon, former commissioner of the Department of Economic and Community Development, both resigned on April 27. Brown resigned after concerns arose about his ownership of a consulting firm that has extensive dealings with DEP and now is head of the State Planning Office. Congdon resigned from DECD after he was accused of making racially insensitive and inflammatory remarks about college students and the prospects for economic development in Aroostook County. The Maine Democratic Party released a statement Wednesday saying Olsen’s resignation was the latest example of LePage’s poor leadership abilities. “In any other line of work, a new CEO who couldn’t keep his own hand-picked team together for more than a few months would be out the door,” the Democrats said.